James Bond's 50th Anniversary is turning out to be as big as 2008 was in commemorating Ian Fleming's Centenary year. 2012 sees the production and release of Bond 23 Skyfall, the release of the Bond 50 Blu-ray box set that includes all 22 films as well as the launch of the BOND IN MOTION exhibition at Beaulieu National Motor Museum celebrating 50 years and 50 vehicles of James Bond. Update: Of course the BOND IN MOTION exhibition now has a home of it's own at the London Film Museum in Covent Garden. To commemorate 50 years of Bond rather than present some modern media from Skyfall which is currently filming in London using an unprecedented number of local locations. I thought I would go retro and highlight a location that would please true Bond aficionados. So here is a location used in a classic James Bond film and one of my favourites - Thunderball. A couple of years ago I jetted off to the Bahamas to visit locations used in James Bond films and my enthusiasm for watersports get married. As well as staying in two Bond hotels (One&Only Resort from Casino Royale and the British Colonial Hilton from Thunderball & Never Say Never Again - unfortunately not in their Bond suite), diving both the local Bond undersea wrecks with Stuart Cove (the outfit that taught Sean Connery to dive) and visiting many Bond film locations across the Bahamas. We were fortunate enough to stay at the incomparable Staniel Cay Yacht Club used as a Bond base whilst filming some Thunderball water based scenes and situated right next to Thunderball Grotto (or James Bond Cave or as it was known in Thunderball - Golden Grotto, fictional home of Largo's "the most dangerous, the most savage Golden Grotto Sharks - which I snorkelled almost every day. If you visit Staniel Cay Yacht Club you can still find a couple of old photos taken during filming on the wall in the bar area. Contrary to online reports the Bahamas have been used in eight six Bond films. Three of them; Thunderball (1965), Never Say Never Again (1983) and most recently Casino Royale (2006) actually featured Bahamas locations. Whilst four; You Only Live Twice (1967), The Spy Who Loved Me (1977), For Your Eyes Only (1981) and The World is Not Enough (1999) used a second unit to shoot underwater scenes only. Testament to just how good the underwater conditions are, as Pinewood Studios - home of James Bond have one of the best underwater shooting facilities in the world. An eagle eyed Bond fan and long time Bahamas resident has pointed out the gate below from the Rock Point location does not actually feature in Thunderball. 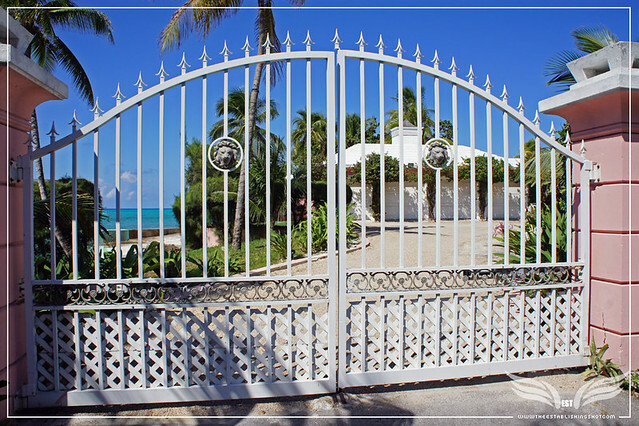 But the entrance from the Lyford Cay Estate. In Thunderball James Bond heads to The Bahamas to recover two nuclear warheads stolen by SPECTRE agent Emilio Largo in an international extortion scheme. Originally intended as the first Bond book to be adapted to film Thunderball was the fourth Bond film. Marred by copyright issues due to claims that Ian Fleming's novel used elements of a screenplay that Ian Fleming, Kevin McClory and Jack Whittingham had collaborated on previously. 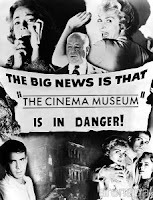 Resolved out of court and giving Kevin McClory some rights to the material meant that Kevin McClory ended up with a Producer credit on Thunderball, Dr No became the first James Bond film to end up on screen and McClory was able to make Never Say Never Again the unofficial Bond film in which Sean Connery returned as James Bond in 1983, using similar elements as Thunderball. With an estimated budget of somewhere between $6 - $9 Million, higher than all the combined budget of the previous Bond films, Thunderball signalled James Bond's shift into the realm of large scale epics and became the formula for Bond films that followed. It was also a major return to the underwater world that Ian Fleming was so enamoured by with a quarter of the film taking place underwater. 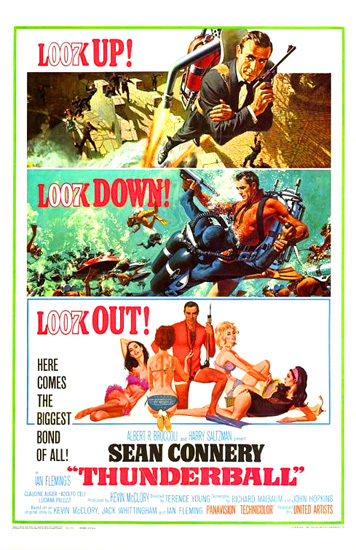 Thunderball became one of the highest grossing of the time as well a reached many critics Top 10 films of the year lists. If adjusted Thunderball's taking would make it the highest grossing Bond film ever. But it also signalled the beginning of Sean Connery's disinterest in playing Bond - as the focus had shifted from character to gadgets and stunts and was Terence Young's last Bond film. The opening scene of Thunderball was shot in France and the film continues in the UK and then James Bond heads to The Bahamas for Operation Thunderball where the bulk of the shooting took place apart from some aerial parachute shots taken in Miami. There are a number of Thunderball locations to visit in The Bahamas but one of the most memorable locations of Thunderball is the villain's lair. 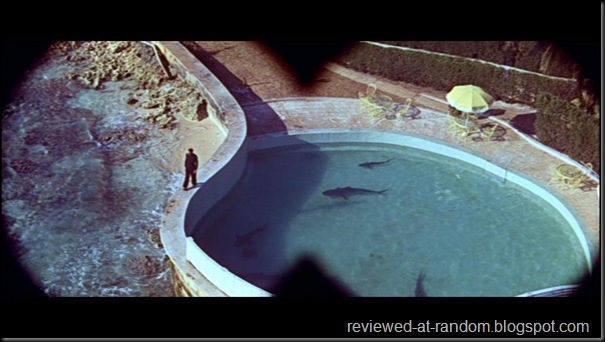 The eye patched Emilio Largo played by Adolfo Celi had his Bahamian sea side headquarters Palmyra Estate with pools filled with man eating sharks (although they do look like relatively harmless Nurse Sharks). Of course James Bond makes short work of navigating the shark infested waters but it does make for good albeit incredulous viewing. 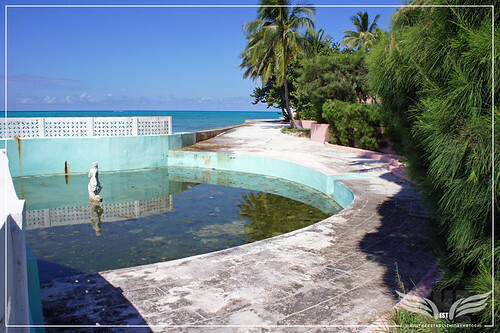 The Palmyra Estate is actually a private home called Rock Point with two pools overlooking the sea as portrayed in Thunderball . In fact the Palmyra Estate is exactly as you see it in the film albeit a little worse for wear 45+ years later. Whereas many other locations have sadly had complete face lifts or been redeveloped. The Establishing Shot: James Bond Thunderball Film Location - Emilio Largo’s Palmyra Estate - Rock Point, New Providence Island, Bahamas, a photo by Craig Grobler on Flickr. The Establishing Shot: James Bond Thunderball Film Location - Emilio Largo’s Palmyra Estate Shark Pool - Rock Point, New Providence Island, Bahamas, a photo by Craig Grobler on Flickr. In 2006s Casino Royale in one scene Daniel Craig's James Bond is seeing driving his rented Ford Mondeo towards his hotel the One&Only Resort on Paradise Island. 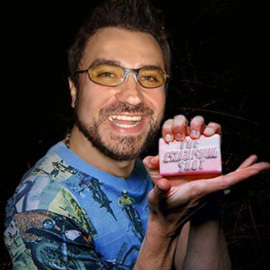 In real life he is actually a couple of minutes from passing Rock Point. 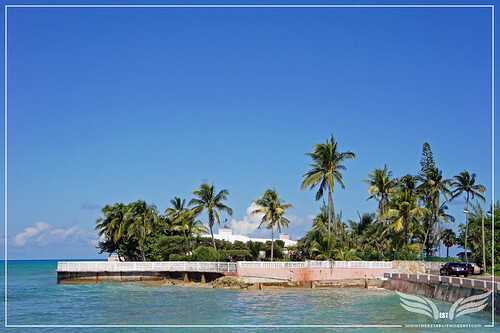 Interestingly enough Bond lands at a private airport on Paradise Island, is then seen driving on West Bay Street, New Providence Island before returning to Paradise Island. As a reference to Thunderball when arriving in The Bahamas Daniel Craig's water plane is seeing flying by British Colonial Hilton before landing. Interesting estate ( Palmyra Estate) at Rock Point in Nassau, Bahamas. I was lucky to be able to visit the estate a few years ago. The owner was nice enough to show me around for the afternoon. Nassau would be a nice place to retire to.